Thanks to everyone who came to my Saliva Tree private view last Thursday at KK Outlet – I can safely say that a lovely night was had by all. The evening held for me a real sense of occasion, coupled with an excuse to meet up with some dear friends and also celebrate the happy ending of the saliva tree project – basking in its success for a moment before I move on to projects new. 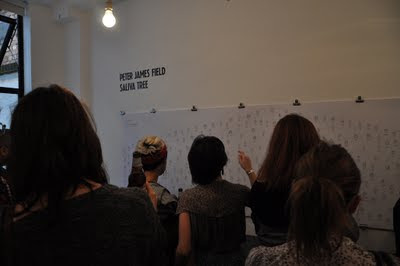 In terms of the public reaction to the piece… well, the fact that the entire two hour duration of the private view people were clamouring to look closely at the tree, follow the connections and, in some cases, take souvenir snaps on mobile phones, made it all worthwhile. The show runs another three weeks – closing on August 27th – so pop by if you missed the preview. Details here. Don’t forget the Saliva Tree souvenir book – also available at my online shop now.